Renee Young introduces the kickoff panel, the social media lounge, and Sam Roberts out with the crowd. Chronicling the history between Orton and Wyatt. The panel talks about the darkness in Randy Orton and the deviousness in Bray Wyatt. HBK and Booker pick Orton, Lawler picks Wyatt. The panel then talks about the wildcard that is Shane McMahon and the phenomenal year that AJ Styles has had. The whole panel picks Styles to win. A synopsis of the Triple H/Seth Rollins feud. HBK thinks that if Rollins doesn’t win tonight, he’s done. The entire panel picks Triple H to win. Try Final Fantasy XIV Online! Peter Rosenberg walks down the massive ramp as he looks out over the crowd. Renee Young wonders how much the Jericho/Owens match is about the US Title, and how much is just about tearing each other apart. Booker picks Owens, Lawler picks Jericho, HBK also seems to pick Jericho. Lita replaces Lawler on the panel and talks about how proud she is of the women in WWE. For RAW, Lita picks Bayley, Booker and HBK pick Nia Jax. For SmackDown, Booker and HBK pick Alexa Bliss, Lita picks Naomi. Next, Booker T talks about being his best when he was with his queen Sharmell. Really good match. It started with Aries going on some quick and energetic offense, then after a commercial break it settled down to a more methodical pace. There were some big, good-looking moves from both guys, and Neville started to get the upper hand with some brutal German suplexes. The match might have bogged down a little in this segment, but the finish made up for it with a couple close false finishes and a satisfying ending. Nice first match of the night. Lawler is back in place of Lita, and the panel talks about the Cruiserweight match. Coming soon on the WWE Network. Renee Young reintroduces the show for the second hour. As the final participants in the next match head to the ring, Rob Gronkowski (NE Patriots) is in the front row. This was okay. It was a battle royal, so that’s fun, but there wasn’t anything particularly special about it in my opinion. The only interesting thing was the football player who interfered in the match (Rob Gronkowski), but it was more interesting because of the security guard who didn’t seem to be in on the story rather than what the guy did in the ring. When Rob climbed over the barricade towards the end of the match, a security guard ran up and held him back. Three of the ringside referees came over to apparently inform her that it was part of the show, so she let Rob go. This kind of killed suspension of disbelief because why would the referees allow a fan to do that? It was also pretty funny though. Afterwards, you can see the security guard laughing a little and Charles Robinson go over to tell her something. Probably “good job.” Oh yeah, and I didn’t really care about who won this match. The panel discusses Goldberg versus Lesnar. They think it won’t go down like it’s gone down before, and they think Paul Heyman seems nervous. Sam Roberts is going crazy with the crowd. Sort of. They’re excited about Mojo Rawley’s win. Sort of. Not really. The panel thinks Mojo Rawley is heading towards bigger and better things after tonight. Maria Menounos (with Charly Caruso) attempts to introduce Paul Heyman, but he prefers to do it himself. Heyman then answers some of the internet’s pointless questions. Booker picks Goldberg, Lawler and HBK pick Lesnar. The panel discusses Corbin’s chance to step up and Ambrose’s danger of stepping down. Peter Rosenberg feels something in the air. This was pretty good. About a SmackDown main event quality match. I liked some of the counters, such as Corbin booting Ambrose when he tried to bounce off the ropes for a clothesline, but they didn’t bring a whole lot of new stuff to the match. With the buildup of violence and hate, I thought there would be more of both of those things in this match. The panel briefly discusses Reigns versus Undertaker. Peter Rosenberg is also excited about Reigns versus Undertaker. Sam Roberts mentions that Roman Reigns is likely to get booed tonight. Renee asks HBK what it’s like to prepare to face The Undertaker at Wrestlemania. Buildup for Undertaker versus Reigns. Two hours is a very long time for a pre-show. You can only talk so much. I would have liked to have seen some more (or any) backstage stuff with some of the competitors from the main show. Some last-minute promos, some story setups, something. As it is though, this show was an average kickoff. Easily the most entertaining match of the kickoff show. It had the best action and the most tense moments. It looked like both guys wanted to be on the main show, or they were just taking advantage of the opportunity to perform in front of such a large crowd. Or maybe they were trying to make people feel bad about showing up to the stadium after their match had taken place. Either way, this was very good. 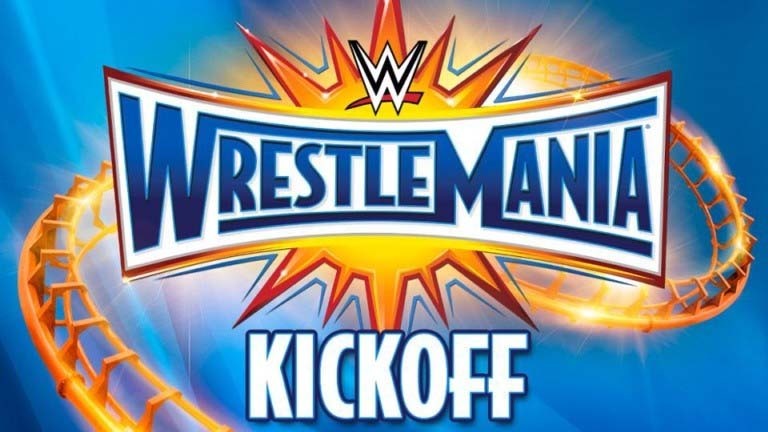 >> Click here to continue to the main show, Wrestlemania!